This is going to sound a little strange, but today’s recipe is a chocolate strawberry anxiety smoothie! I know what you’re thinking: how can a smoothie calm an anxiety attack? Trust me, as someone who has lived with anxiety attacks most of her life, you’d be surprised by what a little cold chocolate goodness can do to ease the nerves! By now, I’m sure you’ve read all about the health benefits of chocolate (when eaten in moderation, of course). In small amounts, it may lower your blood pressure and boost your antioxidants. When it comes to relieving anxiety, studies are still inconclusive. However, chocolate does contain a small amount of magnesium, which may help stabilize your moods. Theobromine, the substance that makes chocolate deadly to dogs, also acts as a mood elevator in humans. 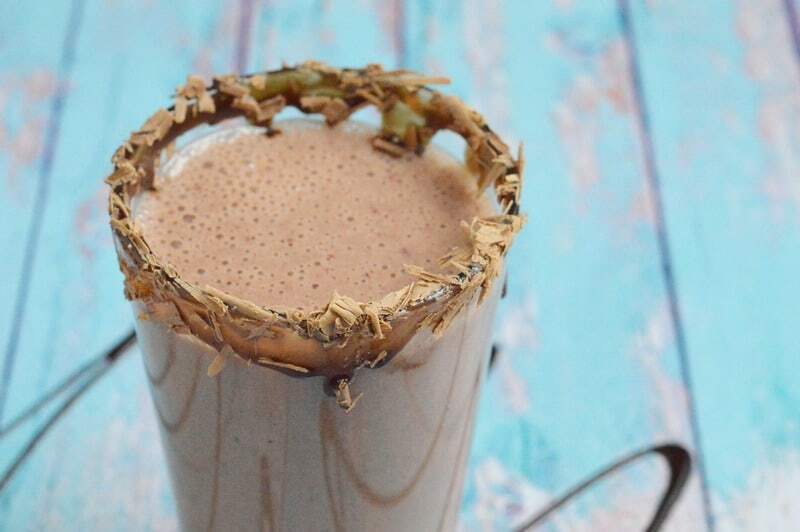 Will this chocolate strawberry anxiety smoothie stop your worst panic attacks dead in their tracks? Probably not. When I’m completely freaking out, very few things can stop the world from spinning out of control. When I’m just feeling mildly anxious, though, the combination of sweet chocolate and the cooling sensation from a smoothie, coupled with the distraction that sipping on the icy drink brings, is sometimes enough to help me dial it back a notch. I literally “chill out” a bit. 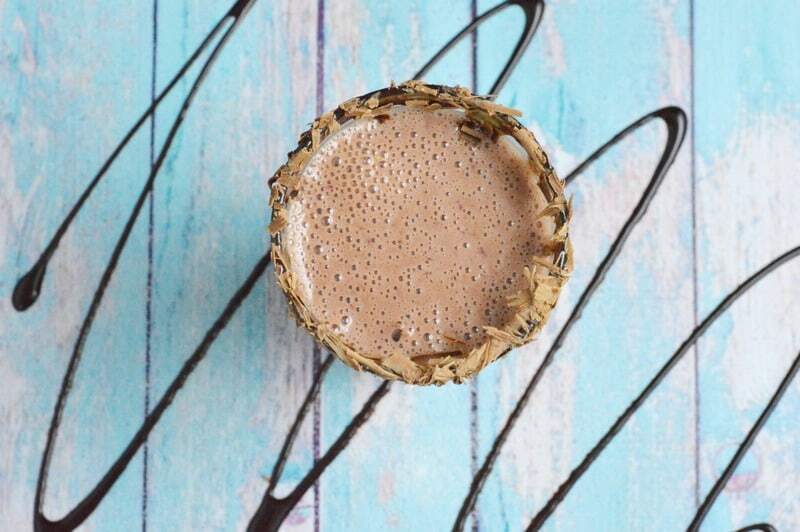 Let’s check out how to make this chocolate strawberry “anxiety smoothie,” shall we? Do you have a go-to food or healthy “anxiety smoothie” that you love when you’re feeling a bit overwhelmed? Share in the comments! 1. 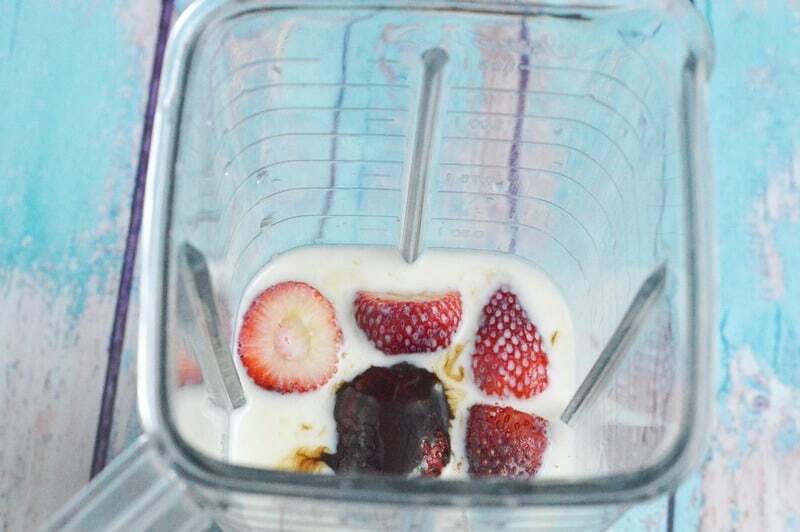 Place all ingredients in blender and mix until smooth with no strawberry chunks. 2. If you would like to decorate your cup, simply pour some chocolate syrup onto a plate and place the mouth of your glass on it, rubbing it around a bit to get adequate coverage. 3. You can either buy shaved chocolate or use a knife to cut a candy bar into shaved pieces. 4. Make a small pile of the shaved chocolate and rub the rim of the glass in it so that the chocolate syrup will pick the chocolate pieces up. Drink right away, obviously. While you can theoretically make smoothies ahead of time, I think they taste best when you drink them immediately. Place all ingredients in blender and mix until smooth with no strawberry chunks. place the mouth of your glass on it, rubbing it around a bit to get adequate coverage. You can either buy shaved chocolate or use a knife to cut a candy bar into small pieces. Make a small pile of the shaved chocolate and rub the rim of the glass in it so that the chocolate syrup will pick the chocolate pieces up. 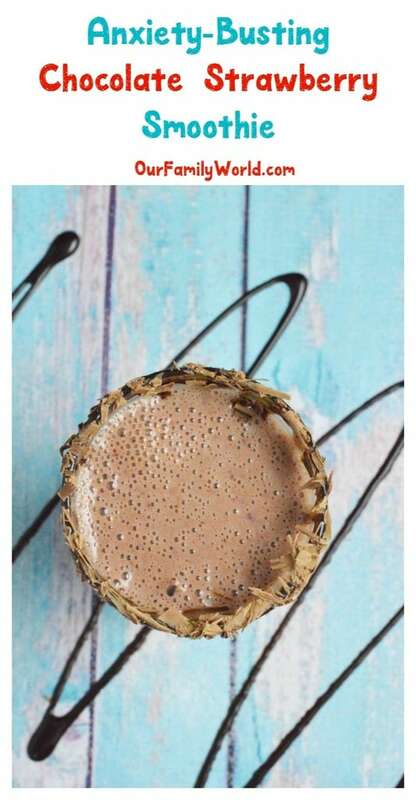 Aside from the delicious chocolatey goodness, the act of making this smoothie recipe can help calm you down too. The trick is to focus on each step. Really focus on it. Don’t let your mind wander. Instead, say to yourself, “I’m making my anxiety smoothie. I’m adding the chocolate. I’m blending the ingredients.” Talking to yourself through every step sounds a little silly, but it’s actually therapeutic. Seriously, my therapist recommended it, and she’s brilliant. who would have guessed that this would work; wow. You had me at chocolate and anxiety! I need to make smoothies more – truly! I’m trying to take online college classes with kids home on summer vacation. I need this smoothie! 🙂 Thank you so much for joining the gathering at Thoughts of Home on Thursday. Way better than medication, thank you! I love anything that involves strawberries & my goodness this is a yum treat with the combination of chocolate with it. The smoothie looks so delicious that I would love to try it right away. Yum! That sounds great. My kids are really into smoothies–me too! This is one smoothie recipe I will have to try indeed. I love that this is a calming anxiety smoothie and will probably be drinking this a lot. Thanks for sharing this recipe and the information. This Chocolate Strawberry smoothie looks so dang delicious I am craving one right now and I got no strawberries what! Its off to the store for me coz I love me some chocolate loving. Glad you get some reliefe from anxiety with this as well! this looks so good. i’ll have to try and make it soon. Love the idea and how simple this is! I think I”ll prepare a batch this weekend for my boyfriend and I. If this smoothie doesn’t lessen your stress then I don’t know what will. 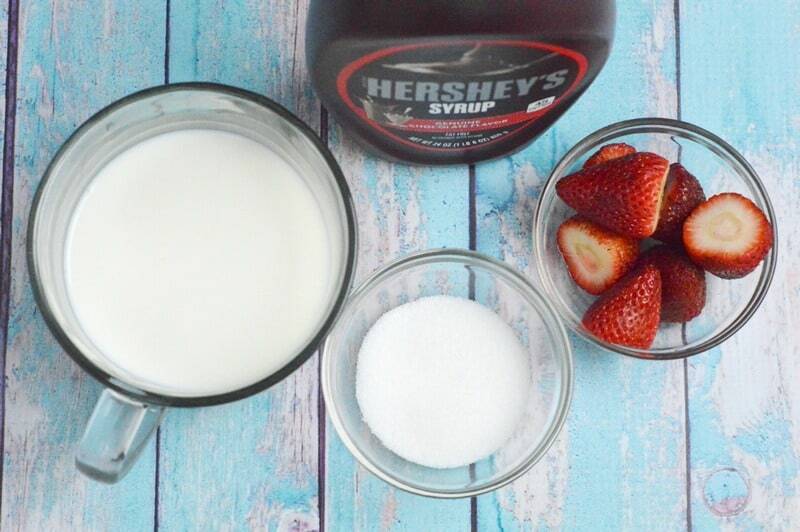 It’s like blending a chocolate covered strawberry and who doesn’t want that, right? I bet my kids will love this! Thanks for the easy smoothie recipe! Oh, honey. I would LOVE to banish anxiety with this. In fact, with three of them! They look so lovely. And I’ll be they are soooo delish!